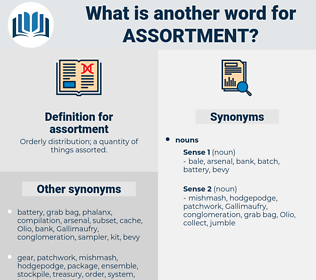 What is another word for assortment? 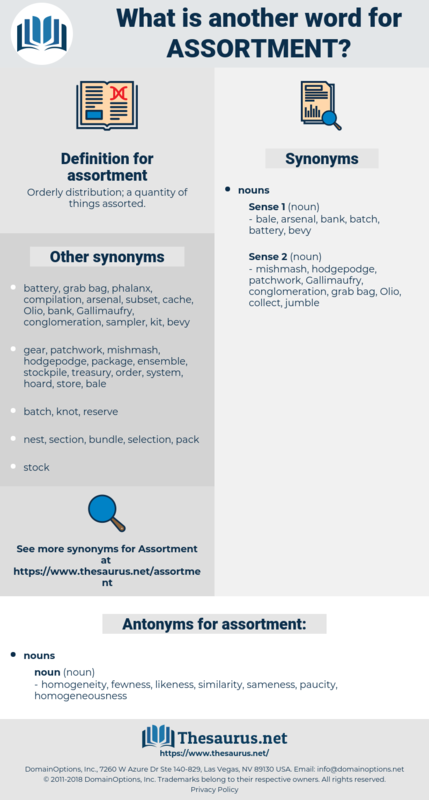 Orderly distribution; a quantity of things assorted. selection, diversity, series, multitude, myriad. range, variety, array, combination, mix, panoply, spectrum, plethora, basket, cross-section, set, gamut. homogeneity, fewness, likeness, similarity, sameness, paucity, homogeneousness. To quote from a recent editorial in the " New York Times": " A course in medicine and surgery is expensive, and takes a lot of time, while a varied assortment of pseudo - religious and pseudo - philosophic phrases can be learned in a few days by any man or woman with a disinclination for honest work." The assortment was various enough. accordant, acquired immunity, ascertained, acrodont. hodgepodge, mishmash, mingle-mangle, omnium-gatherum, melange, sampler, odds and ends, alphabet soup, selection, witches' broth, witch's brew, ragbag, farrago, range, hotchpotch, witches' brew, grab bag, oddments, Gallimaufry.